Hugh Joseph Riddle was born on 24th May 1912, the son of a GP who had emigrated from the United States to England where he married Hugh’s English mother. Throughout his life Hugh would be known by family and friends as ‘Huseph’, an elision of his forenames. He had the option of claiming US citizenship but became British at 18. The family, based in London and now including his brother Jack (who would later serve alongside Huseph in the same RAF squadron), enjoyed long summer holidays at their holiday homes at St Briac in Brittany and Mandelieu on the French Riviera. Huseph was educated at Harrow from 1926 to 1930 then went up to Magdelen College, Oxford where he showed considerable athletic prowess. He went on to the Slade School of Fine Art and then to master portrait painting under the tutelage of Sonia Mervyn ARA. In 1937 he married Joan (Tinker), daughter of Claude Johnson, first Managing Director of Rolls-Royce Ltd and first Secretary of the RAC. They made a very glamorous couple. 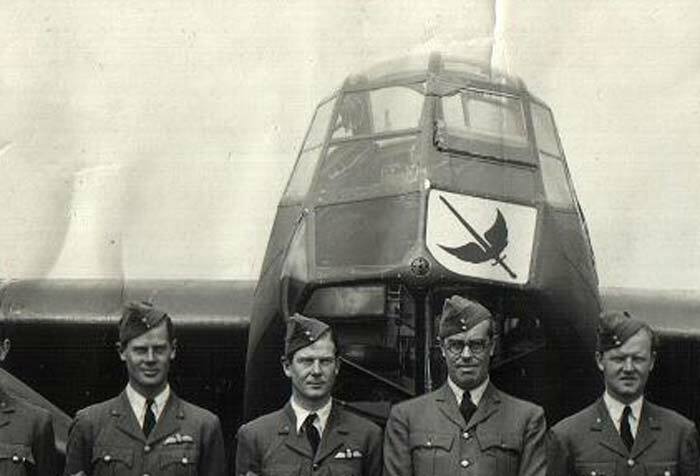 In the late 1930’s Huseph and Jack had joined the Auxiliary Air Force for the joys of weekend flying with 601 Squadron, known as the ‘Millionaires’ Squadron’ because of the wealth and good connections of many of its pilots. In May 1940 the squadron saw action in France flying Hurricanes. When interviewed in 2004 Huseph said that when he returned alone from combat to his French airfield (probably Merville) it was deserted, having been hurriedly evacuated while he was in the air. His Hurricane was out of fuel. An army lorry drove at speed over the airfield to him and the commander suggested that he climb aboard at once as German forces were very close. Huseph was trying to remember how to activate the self-destruct device in the Hurricane, this would prevent it falling into German hands intact. He turned the handles and switches on the device and stood clear. Nothing happened. By now the soldiers were threatening to leave without him. In desperation he drew his service pistol and fired all its rounds into the aircraft. No explosion or fire materialised so he gave up and climbed aboard the lorry. The RAF were heavily outnumbered and by Sunday 19th May were operating from bases in the UK, their French bases having been overrun. On this day Huseph was shot down in Hurricane L2081 by Me110’s over Douai, his aircraft force-landing near Amiens from where he said a recalcitrant horse helped him reach Paris. Huseph served with 601 throughout the Battle of Britain from Tangmere and Middle Wallop airfields. At one point Huseph’s Hurricane had much of its outer wing shot away but, after a terrifying dive, he recovered enough control to land at Tangmere. On 11th July 1940 he shared in the destruction of a Me110 of III/ZG76, the aircraft coming down near Warmwell in Dorset. Combat stress had taken its toll on Huseph who much later said he had never been comfortable with the lethal aspect of fighter action and had originally dreamed more of the delicacy of flying light aircraft; not so surprising in an artist. 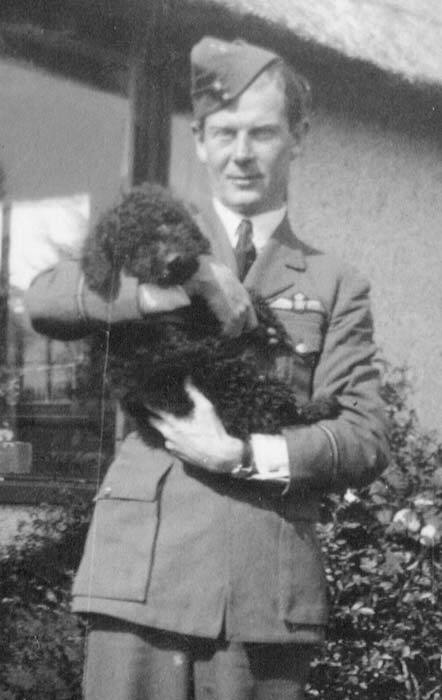 He became a fighter controller in Scotland, combining an unexpected talent for this task with his air combat experience to win special respect from pilots he guided to interceptions. After the war Huseph resumed his portrait painting career and the family now with son Hugh (Ras) and daughter Victoria (Wicky) settled near Boxley in Kent. He became a member of the Royal Society of Portrait Painters and exhibited regularly at the Society’s Summer Exhibitions and at some Royal Academy exhibitions. He painted many well-known individuals from society and business and their family members. His portraits of children have been widely admired for their softness and warmth. In 1965 he painted the Queen for the RAF Regiment and soon afterward Prince Edward, commissioned as a gift from the Royal Household to the Queen and Prince Philip on their Silver Wedding. Huseph did some leisure flying after the war then around 1950 then took up dinghy racing and with typical aptitude and versatility soon won the Fleetwind class championship. He later became very successful amongst the much more numerous Firefly class and was competing successfully well into his 60’s. His second daughter Arabel was born in 1954 and in 1960 the family moved to London. In 1974 Huseph retired and he and Tinker moved to France. He remained at their house following Tinker’s sudden death in 1994 but then moved to his daughter Arabel’s home in Manosque, France in 2003. Throughout his life, Huseph’s legendary good looks and charm and generous manner won him many friends and he remained unaffectedly young at heart. He was very fond of and much liked by the French people he encountered and who cared for him with great devotion through his last years. Huseph Riddle died on 16th April 2009 aged 97 at Pierrevert in France after a very short illness. He is survived by his children. 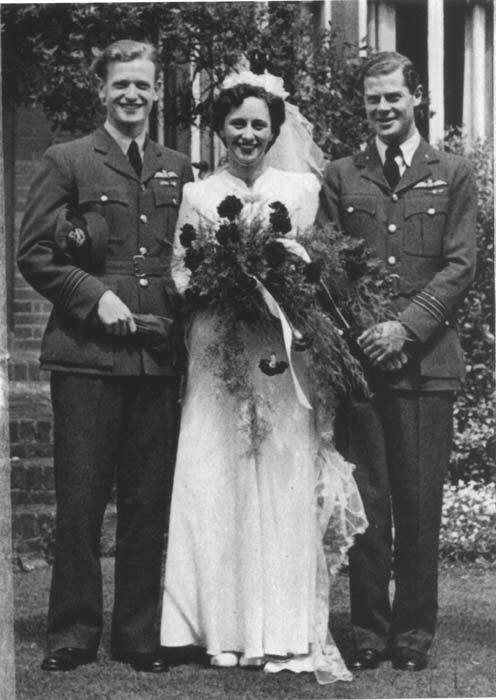 Huseph, far right, as best man to another Battle pilot, P/O TF Neil, on his marriage to Eileen.